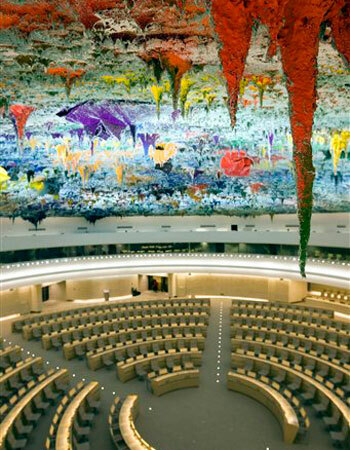 The U.N. Human Rights Council, frequently accused of coddling some of the world's most repressive governments, threw itself a party in Geneva Tuesday that featured the unveiling of a $23 million mural paid for in part with foreign aid funds. In a ceremony attended by U.N. Secretary General Ban Ki-moon, Spanish artist Miquel Barcelo told the press that his 16,000-square-foot ceiling artwork reminded him of "an image of the world dripping toward the sky" — but it reminded critics of money slipping out of relief coffers. Oh, well. A lot of real damage could be done with $23 million, so maybe we ought to be happy it's staying, um, in house. Hundreds of thousands of citizens of the Congo could not be reached for comment. Or anything else. It's pretty funny (not really, it's sad) that they would spend $23 million on that while the countries they are charged with aiding and protecting are eating dirt pies. BTW, how's the U.N. "peacekeeping force" been doing with those Bosnian pirates? Now hearning all that much about THAT, are we? Too busy with the MURAL, I guess.